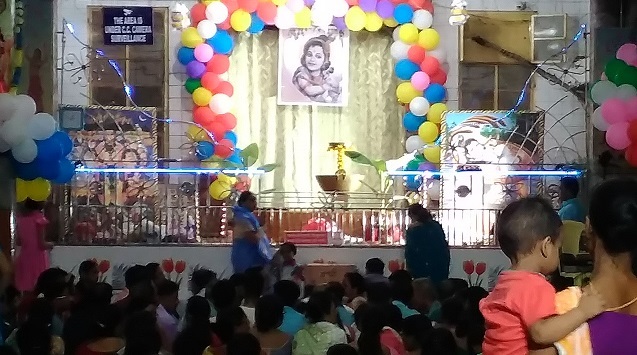 Janmasthami, a revered festival for the devotees of Lord Krishna to herald his birth at 11:45 pm midnight, was celebrated with great pomp and show in one of the oldest temples called – Shyam Sundar in Silchar of Assam. Thousands thronged this 165 year old temple to grace this occasion, wherein, for the past two days, hectic parleys were witnessed in this temple premises to mark this occasion that is followed with principles of ‘vaisnavism’ to its fullest. On Sunday, an art competition was held to depict Lord Krishna in its various forms which was later followed by recitation of ‘shlokas’ from Bhagvad Gita by students from various age groups, with the culmination of a dressing up as Lord Krishna by kids. On Monday, after their daily ritual of ‘arti’ in the morning, the temple committee members got down to handle a humongous crowd later in the evening. Devotees in thousands who came up with fruits and sweets were allowed to keep in the temple with a token given to take this back on the morning of Tuesday. Not only that, in order to feed close to 10,000 devotees at night, post the ritual of the birth of Lord Krishna, the cooks of this temple got busy in preparing ‘prasadam’ for all its devotees. As the devotees started pouring in, the ritual for the birth of Lord Krishna began at around 11 midnight on Monday which got over by 12 that night for the devotees to take prasad after such a long wait. Each devotee could savour a sumptuous meal as prasads of eight to nine items were served to each of his devotees. Before that, during the bathing ceremony of Lord Krishna, close to 200 litres of milk was poured during this ritual which was later served to all his devotees present that day.